2. Place chicken breasts on the bottom of the crock pot and add the chicken broth. 3. Combine the tomatoes and spices in a small bowl and mix well. Add the mixture in the crock pot. 4. Cook on low for 6-8 hours. 7. 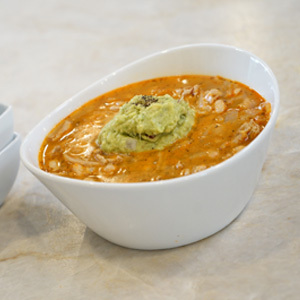 Serve in a bowl and add desired toppings. This is one of those recipes I came up with by throwing whatever veggies and spices I had in my pantry and fridge and it came out amazing! Don’t be afraid to experiment and add whatever veggies you like! 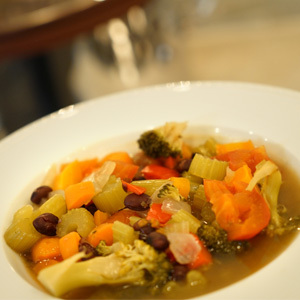 This stew is great in the winter, during holidays in between all the indulging and also works in the summer because it’s so light. A good option if you have Vegan guests. 1. Chop, dice and wash all veggies. 2. Throw everything in crock pot. I use Eden Foods canned beans because they are BPA free. If you use canned beans, make sure to rinse them prior to use. This will remove quite a bit of the salt. And check the label! Ideally, there would just be water, a small amount of salt, and the vegetable. You would be surprised at how many additives and extras some manufacturers add to beans. This is a wonderful meal during the fall and winter months when butternut squash is in season. I was inspired by this dish when I visited a good friend in NYC a few years ago and I haven’t stopped making it for my family since. 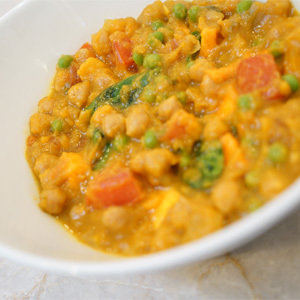 I am a huge curry fan and putting it together with Chickpeas and Butternut squash makes for a super nutritious and delicious meal. 1. Rinse and sort through the dry chickpeas. for the green peas and spinach. 4. Cook on high for 6 hours. and spinach, and give a stir. topped with fresh cilantro, mint or basil. Chickpeas, also knows as garbanzo beans, are rich in fiber. According to the American Diabetes Association, they can also help reduce cholesterol levels. I think it’s so important to have a great chicken soup handy when it starts to become cold outside or someone in your family is feeling under the weather. 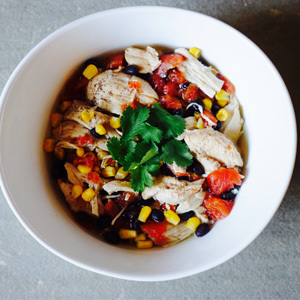 I love this Chicken “No Noodle” Soup because it’s so easy and delicious. Noodles turn into sugar as they are digested in your body so I started cutting out noodles a long time ago. 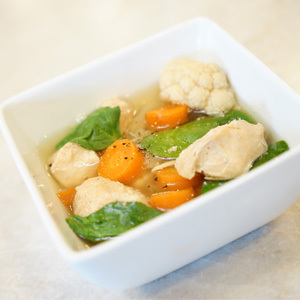 Sugar feeds sickness, so having this chicken soup without the noodles makes so much more sense for trying to get healthier and stay healthy! 1. Wash chicken and cut into chunk size pieces and place into the crock pot. 2. Chop all veggies and place on top of chicken. 3. Add the chicken broth, garlic and herbs de provence, salt/pepper. 4. Cover and cook on low for 8-10 hours. Garlic boosts the production of something known as hydrogen sulfide. This powerful food has natural anti-infection and anti-viral properties and naturally boosts the immune system. Talk about a recipe of convenience. The preparation time for this chili is less than 15 minutes. The hardest part is browning the turkey (and that’s not hard!). A lot of time cooking from scratch takes longer but whenever I can make something homemade I feel like I’m really doing something good for my family. I love that I can save time with this recipe and still know that what I’m giving them is good and good for them! onion and garlic for about 10 minutes. Set aside. 2. Add the Chili Mixture to crock pot. 3. Add the browned ground turkey. 4. Cook on low for 4 hours. You could kick this chili up a notch by using Applegate Organics fire roasted red pepper or Andouille Sausage. It’s already seasoned with spices!